You are currently browsing the Carpe DMM blog archives for October, 2012. I took this photo in the Gallerie dell’Accademia in Venice earlier this year. It’s a detail of the painting Presentation of Jesus in the Temple by Vittore Carpaccio, painted in 1510. 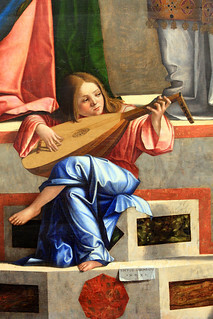 This detail shows an angel playing the lute, sitting on the steps below the alter where Mary is presenting the baby Jesus. It turns out this is a very popular detail from this painting, and you can find dozens of similar images just showing this portion of the painting on the web. The weird thing is how different in colour they all are. I presume many of them were taken as photos some time ago, and since then the painting has been restored, giving it the vibrant colours you can see in my photo. Because that’s what it looked like to me when I was standing right there in front of it. The skirt (pants, whatever that is) was a vibrant blue, as you see here in my photo. But most of the other web images of this same painting show it to be a drab, and even non-blue colour. Wikipedia’s version is astoundingly poor in colour.